Posted on Thursday, September 4th, 2014 at 10:30 am. Plan your Livermore Valley Wine Country visit here or print the driving directions here. 1 Perched atop the Sunol Grade on Sheridan Road, just a half-mile from Interstate 680, Nella Terra Cellars Winery and Event Center is the newest addition to Livermore Valley wine country. The grounds offer a fantastic backdrop and intimate experience for special events, with vibrant green hills in the winter and flourishing vines in the summer. In their hillside vineyard, the Beemiller family has planted two varietals that are well suited to the cooler days of Sunol: pinot noir and viognier. The vines will produce winemaking grapes in a few years. In the meantime, Nella Terra sources local fruit for a variety of artfully made wines, including chardonnay, sauvignon blanc and a red blend called Redded Bliss. Nella Terra Cellars is open only by appointment and prefers groups of 10 or more, so gather a group of friends and call ahead to schedule your visit. Located at 5005 Sheridan Road in Sunol, the tasting fee is $10. Visit them online at www.nellaterra.com. 2 Hop onto I-680 northbound, exit the freeway at Calaveras and head toward Sunol. You will find Elliston Vineyards on Kilkare Road, about a half-mile from Main Street. Established in 1890 by pioneer Henry Ellis, Elliston has produced fine wines since 1890, and has specialized in weddings and special events since 1982. 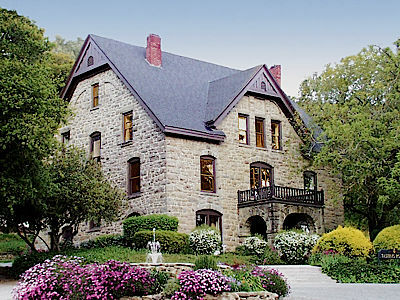 The historic stone mansion, lush grounds and secluded Terrace Room offer a unique and picturesque atmosphere. Elliston cellars and bottle-ages wines for longer than most California wineries. When visiting the tasting room, it isn’t uncommon to experience wines that are four to 10 years old. Located at 463 Kilkare Road in Sunol, Elliston is open 11 a.m. to 4 p.m. on weekends. Wine tasting is complimentary. Visit at www.elliston.com. 3 Return to downtown Sunol and turn right onto Niles Canyon Road, then right onto Palomares Canyon Road. This peaceful, 8-mile trip takes you to Westover Vineyards Winery and Event Center, which offers the largest selection of ports in Livermore Valley. The winery is nestled in a beautifully secluded mountain setting complete with a courtyard fountain and waterfall reception area. Owner William Westover Smyth is descended from the first woman winemaker in the state of California, and his great, great grandfather started farming in Alameda County around 1850. Westover produces all of the wines and ports on site. Located at 34329 Palomares Canyon Road in Castro Valley, the winery is open from 12 to 5 p.m. Saturday and Sunday with a $5 tasting fee. Visit at www.westoverwinery.com. 4 Consider a side trip to ride the rails in Sunol. The Pacific Locomotive Association operates the Niles Canyon Railway as a living history museum interpreting the importance of our heritage railroads in the development of California and the nation. Visit their website at www.ncry.org. For more winery information and help planning your trip to Livermore Valley wine country, please visit www.LVwine.org.